I do apologize for lack of updates yesterday, making up for it today with a double header for P&P. 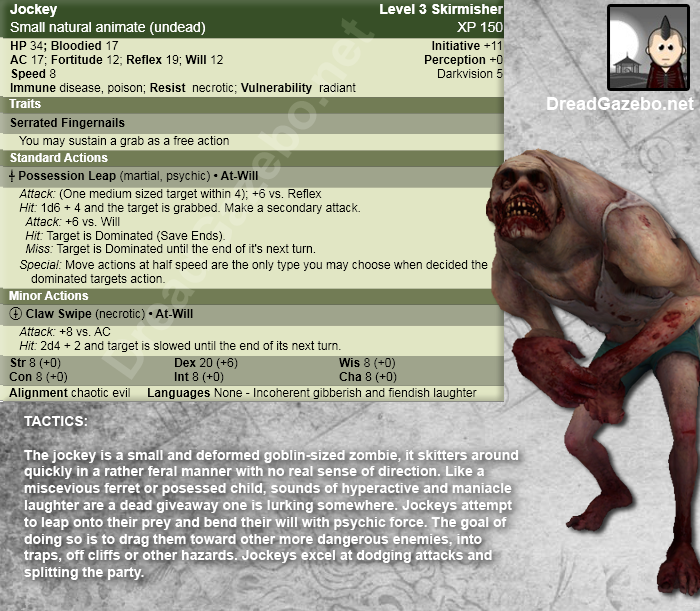 First up is the Jockey which is basically the zombie equivalent of an over sugared child, an overgrown ferret and some sort of feral crackhead with psychic powers. Did I just go there? Yep. Well without further adeiu I give him to you in all of his spastic g lory. Next up this evening will be everyones favorite “The Witch” wherein I will make comparisons to her and Jenna Jameson from the movie “Zombie Strippers” no images though, you’ll have to google those yourself, I know you will. So what is Navation, and why should I worry he doesn’t have the sense of it?